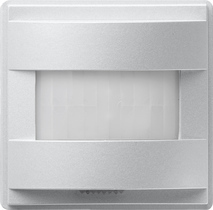 Successor item: System 3000 motion detector top unit, mounting height up to 1.10 m 5374 .. In conjunction with a System 2000 switching insert, the automatic control switch can be set to short-term operation. Short-term operation is brightness-independent and can be used to control a bell, for example. When a System 2000 dimming insert is used, when the set delay time elapses, the lighting is continuously dimmed to the minimum brightness within 30 seconds and then switched off. A memory value can be saved using a System 2000 auxiliary unit which is switched on when motion is detected. The current ambient brightness is easily saved as a brightness switching threshold using a teach-in function. Switchable to permanent-on, permanent-off, or automatic mode using a slider switch. At an mounting height of 1.10 m, the horizontal detection field has no natural limit if used outdoors. Use the System 2000 automatic control switch mounting height up to 2.20 for outdoor use. The System 2000 automatic control switch top units can be operated with the System 2000 inserts as of release R2.